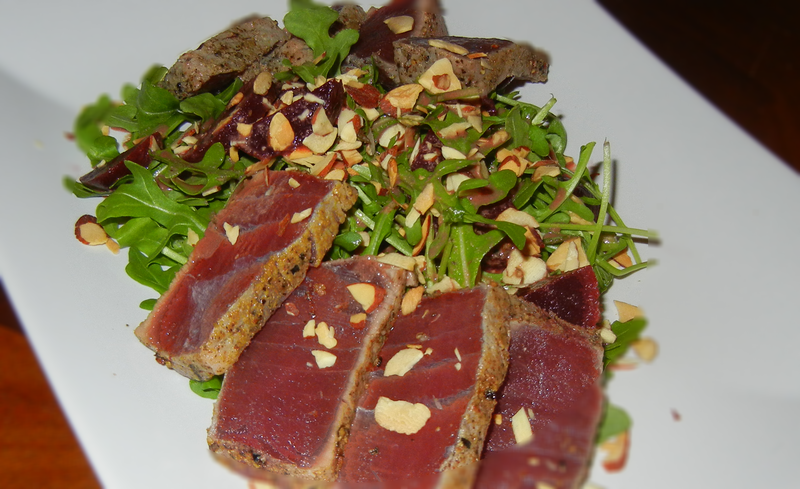 Rolled the tuna piece in some crushed black pepper and paprika, heated some olive oil in a pan, cooked each side for a couple of minutes, let it cool off, cut, added arugula, toasted almonds, chopped beats and a mix of mustard, vinaigrette and soy sauce. Simple and colorful seared tuna salad! This entry was posted in Food, Gluten Free, Health, Life, Recipes, Soups & Salads, Uncategorized, Weight Loss and tagged Dinner, Easy Recipe, Food, Gluten Free, Salads, Seafood, Tuna. Bookmark the permalink.